Search engine optimization is a technique that helps search engines to find and rank your site in response to a search query. It has two main parts – on-page optimization & off-page optimization. In this blog we are discussing about various on-page factors and points to remember while optimizing them. On-page optimization, in a nutshell, refers to all the measures that can be taken directly within the website to improve its ranking in search engines, including title, Meta Descriptions, hx Tags, adding Schema etc. It is a foundational part of the overall SEO strategy implementation that focuses on indexation, crawl ability and website relevancy. Keyword research is an important part of SEO, as these can decide the character of your visitor types. Undertaking effective keyword research plays a critical role in bringing relevant visitors to your site. Find out all the relevant converting keywords related to your niche after studying the business, and plan a keyword theme, including broad and long term, which can drive targeted traffic to your website. You can use tools like Google Keyword Planner, Keyword tool, Google trends etc. to find out converting search terms. Do keyword research by considering search volume and competition using various tools. Title tags—technically called title elements—defines the title of a webpage. Title tags are often used in search engine results page to display preview snippets for a given page, and are important both for SEO and social sharing. Refer the below screenshot and compare the keyword rich, well optimized page title with un-optimized title tag. Meta descriptions are HTML attributes that provide a brief overview of the page’s subject matter. Though search engines do not consider Meta description as a ranking factor, it has an important role in increasing the conversion rates of your website. Therefore, it should be a compelling description which a searcher will click without hesitation. Usually, it shouldn’t be more than 160 words, with relevant keywords inserted into the sentence in a brilliant way. 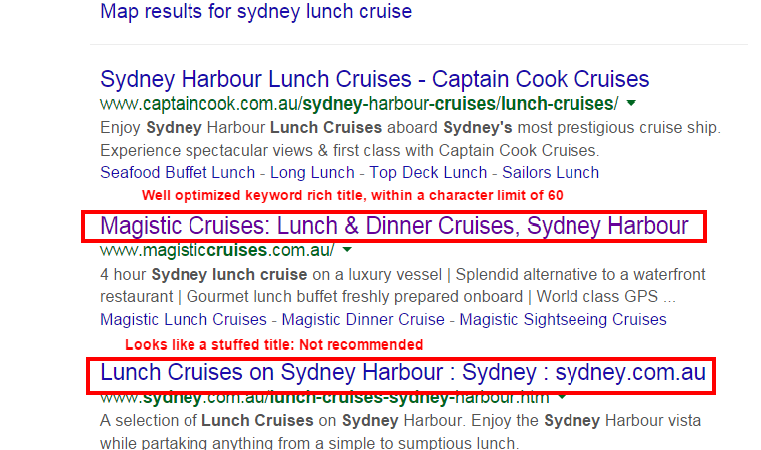 Optimized with main keywords and secondary keywords and location if focusing on location targeting. Refer the screenshot below for understanding the difference between optimized and un-optimized Meta description. The first Meta description truncates before completing the sentence, but in the second example, the optimized Meta description displays the full message without truncating. 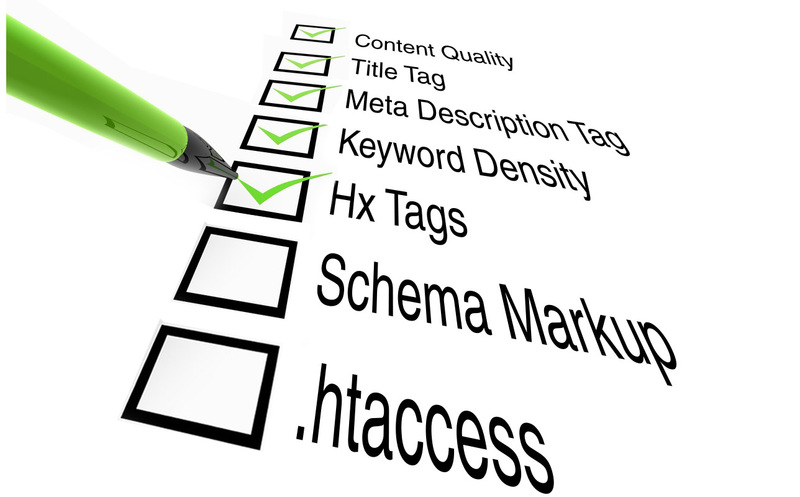 H1 tag is the first and most important heading in the content of a page. It tells what the content of the page is going to be about, so search engines value its a lot. 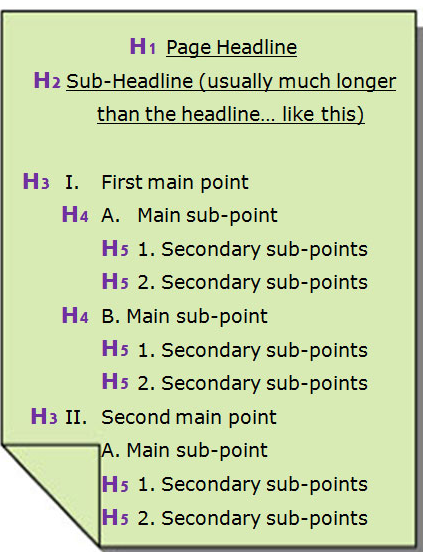 There are six different heading tags: H1, H2, H3, H4, H5, and H6. Collectively these are referred to as Hx tags. They inform the search engine how the content is structured for readability. H1 tag must be unique for every page. H1 should explain what the page is about &amp; should be similar to title but not exact. H2, H3 tags are used properly with secondary keywords to denote the subsections of the page. H4, H5, H6 follows the hierarchical structure by considering the keyword theme. From the below screenshot you can see how hx tags can be utilized in a proper way. Images are a strong visual part of a webpage. Alt text is used to show relevant information about an image to search engines, while Image title is a brief description about the visual content and the context of an image. If optimized properly, they can drive organic traffic from Google image search. Both these information helps search engines to understand the image better. It should contain keywords relevant to the image and content keyword theme. Anchor texts are text parts on a website that has a URL attached to it. Search engines follow the anchor (link) on a page to reach another page. I prefer BBC World News than CNN because it provides more International news and seems to be more balanced. In the above example, the links would tell the search engines that when users search for “CNN”, it thinks that http://www.cnn.com is a relevant site for the term “CNN” and that http://www.bbc.co.uk is relevant to “BBC world news.” If many sites link that particular page/link as relevant for a given set of terms, that page can manage to rank well for these terms. Include both types of keywords – primary and secondary – according to the context of the page. Utilize dofollow and nofollow in a proper ratio in each page. Don’t include too many exact match anchor texts, otherwise it will be counted as stuffed. Your content may be great but it won’t help your marketing efforts if it is not optimized for search engines. The process of making attractive content to search engines is called content optimization. Optimizing a content is not just inserting specific keywords a number of times in order to increase its keyword density, but making the content well-written, organized, useful, relevant and social-ready for website users by optimizing it with the right elements. Utilize all primary and secondary keywords (long term keywords) while optimizing your webpage content. Keep minimum word count on individual pages, since Google panda algorithm penalizes duplicate thin content on webpages. Keyword density is considered as an important on-page metric in on-page SEO. It’s the percentage of times a keyword appears on a web page in comparison with the total number of words on that page. Optimizing your website content with relevant and targeted keywords are mandatory for the success of a SEO campaign. Schema is a type of micro data that makes it easier for search engines to interpret the information on a webpage more effectively, and serve the relevant search results based on user queries. By adding schema, you can alter the way your page is displayed in SERP by highlighting rich snippets that are displayed beneath the page. Tag all possible content with schema, use the http://schema.org for finding relevant data types according to the type of contents like restaurant, event, organization, creative work etc. Check the added schema in webmaster tool and fix errors if any. If there is no relevant schema type present related to your content, you can make use of itemproperty additional type. Having a clear and clutter-free navigation is the best thing you can do to make your website friendly for your visitors. Not over complicating things and configuring navigation equally on each page will greatly facilitate easy browsing of the site. Having clear calls to action with a user-friendly navigation will help make it easier to drive your visitors to goals, and prevent frustration for visitors who have to take unwanted steps for completing a purchase or reach a destination. Site navigation should be easy for users to reach all content on the website. Page speed indicates how fast your webpage loads. Google has indicated site speed as one of the signals used by its algorithm to rank pages. In the recent Panda update, it was announced that the loading time of pages has become an important part of SEO ranking. So it is recommended to optimize page speed using Google page speed insight tool. Pages with a longer load time tend to have higher bounce rates and lower average time on-page. Longer load times have also been shown to negatively affect conversions. Check if the page has a good score on Google page speed insights tool after fixing all the recommendations by Google. The score should be >85 for both mobile and desktop versions. No index tag prevents search engines from crawling a web page. This tag controls access to site on a page-by-page basis. Meta tag into the <head> section of your page. Canonical tag is used when duplicate content problem occurs on a website. In e-commerce sites, it is common for more than two URLs to be represented a single page, this cause a duplicate content issue. You can solve this issue by using a canonical tag to indicate to the search engine which is preferred page or original one. Redirection is the process of forwarding one URL to another. You can either permanently redirect old URLs to new one using 301 redirections or temporarily redirect pages using 302 redirections. If a single page can be accessed using more than one URL, you can redirect these unwanted URLs to original one using 301. Xml sitemap is a file where you can list webpages of a website and indicate to Google about the organization of your webpages. It allows us to include additional information about each URLs, such as when the page was last updated, how often the page changes, and how important the page is in relation to other pages on your website. Xml sitemaps helps to improve spider-ability and ensures that all the important pages on your site are crawled and indexed. After creating xml site, we can submit it to search engines via webmaster Tool so that it will get indexed fast. Robots.txt file gives search engines directions about what content should be crawled on a website. When a search engine bot visits a website, it first checks for the Robots.txt file. A .htaccess file is used to configure the details of your website without altering the server configuration files. It is used for creating custom error pages and redirection. When a htaccess file is placed in a directory, which is in turn ‘loaded via the Apache Web Server’, then the htaccess file is detected and executed by the Apache Web Server software. It gives webmasters easy access to Google webmaster & analytic data that can be used to make decisions for reviewing SEO strategy. Visitor segmentation, with which it’s easy to know how many visitors have increased after an SEO campaign. Monitor keywords that are generating traffic in your keywords list, and ensure you are optimizing the site for them. Analyze site traffic against algorithm updates. On-page optimization is often called the core foundation for success of any SEO campaign. 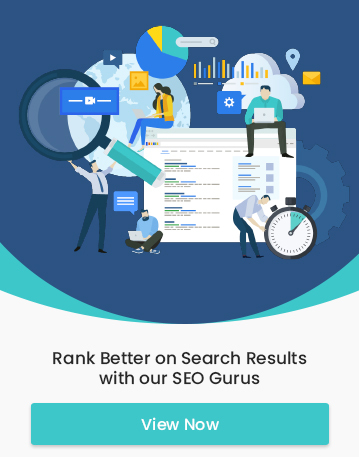 Its SEO durability is longer when compared to other off-page techniques, since all optimization are in accordance with search engine rules. So, give them a try. They are actually pretty easy to implement and worthy with results. Dealing with Negative Reviews – How and When?